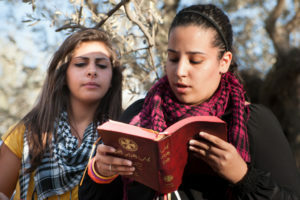 A Palestinian Christian youth reads a Bible text. Q: What is hands down the most compelling and powerful verse in the Bible that promises God's love towards all his creatures? How do you suggest I apply that in my conversations to those who A. might not believe in God but love animals and/or B. might not love animals but believe in God? “Garden club? I’m not trying to join the garden club! What are you trying to do, make me a slave or something?” How do you respond to a question like this?